Amulet w/metal frame. Approx. 47mm x 56mm x 8mm. Newly made in Thailand to look old. Click here for larger image. 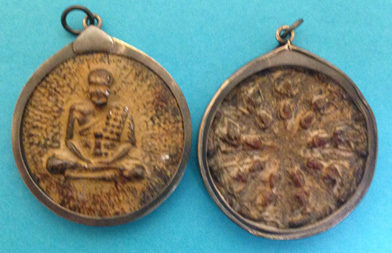 $8.00 amulets can be mixed and matched to receive the quantity discounts. Our website is not set up to calculate price breaks between item numbers. We will make the necessary adjustments in our office and run your credit card manually.